Valentine’s Day is fast approaching and, well… we need each other. Let’s hold hands and get through this together! We’re going to need some tools this holiday weekend. By tools I mean, baked donuts, strong coffee, and festive sprinkles. Coffee, donuts, and love are fitting for every day of the year, but especially appropriate for a Valentine’s Day weekend. I hope you sleep in and share coffee and donuts with someone you want to high-five for life. 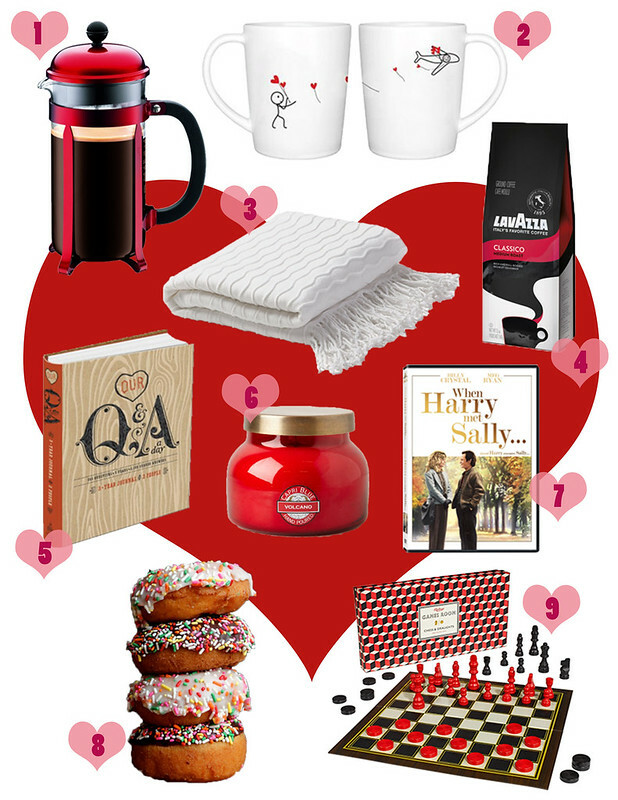 To celebrate the holiday I’ve partnered with Lavazza Coffee to give away a Valentine’s Day Survival Kit! Just a few important things to inspire a lazy Valentine’s Day morning lingering over really fantastic coffee and sweet, tender donuts. 1 • My favorite Bodum French Press. Makes perfect cups of coffee! 2 • Make if official with couple mugs. Few things are more precious. 3 • A good throw blanket. For picnic-style morning coffee adventures. 4 • Critical in any at-home coffee date is the perfect cup of coffee! Lavazza Italian Coffee is my new favorite! Dark, rich, and round coffee without a hint of bitterness. Lavazza makes home coffee feel extra special. 5 • Two people, lots of love, one journal. It’s like a little time capsule of your years together! 6 • Mornings should smell great with this Capri Candle! 7 • I always want to watch When Harry Met Sally and I know you do too. 8 • No coffee date is complete without donuts! They’re tender, sweet, and jam-swirled. Get into it! Here’s the pan you’ll need! 9 • Games of skill and chance on the living room floor: checkers and chess. To enter to win a gift basket filled with Lavazza Coffee, a $25 gift card to Lavazza, and the rest of these Valentine’s treats, please leave a comment below with your favorite Valentine’s Day tradition. Winner will be randomly selected Saturday February 14th at noon est! Now it’s time to make the donuts! 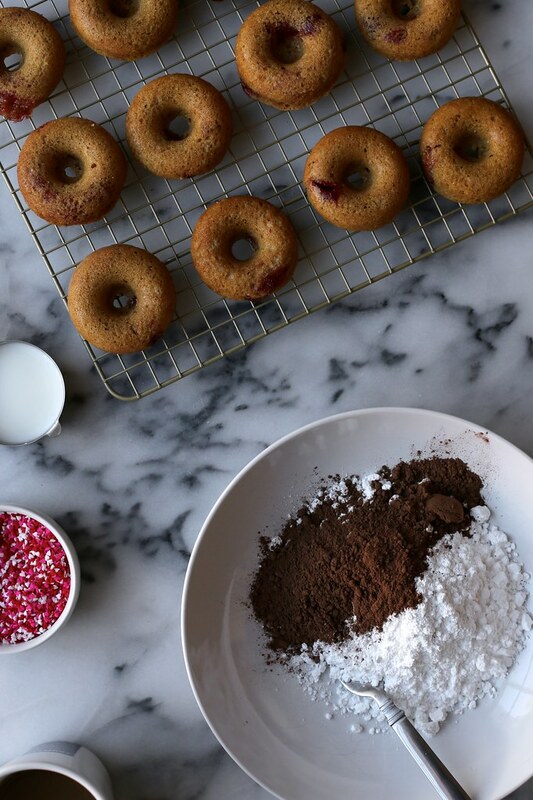 Baked donuts are sweet and easy! 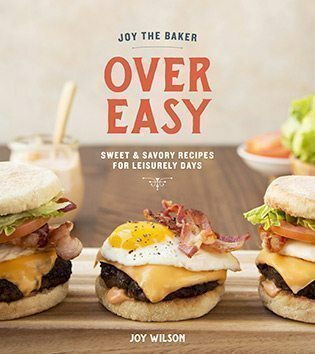 No need to stress the frying. Donuts can be a breeze. Flour plus brown sugar, and a good dash of cinnamon. Egg plus melted butter, good vanilla extract, and buttermilk. You know how they say “It takes coffee to make coffee”? Well… it DEFINITELY takes coffee to make donuts. Come prepared. Wet meets dry aaaanndd stir. The batter won’t be pourable thin, but rather, spoonable thick. Perfect! 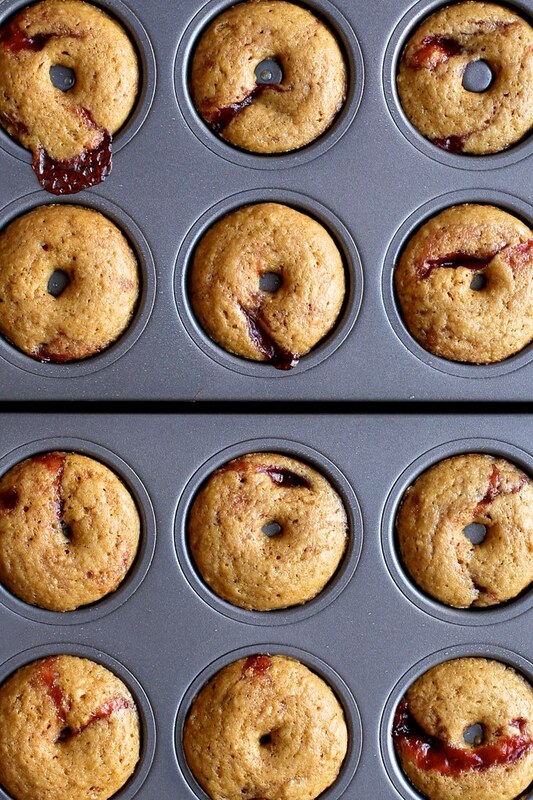 I swirled two big spoonfuls of strawberry jam into the batter then oooh so carefully spoon the swirled batter into mini donut pans. 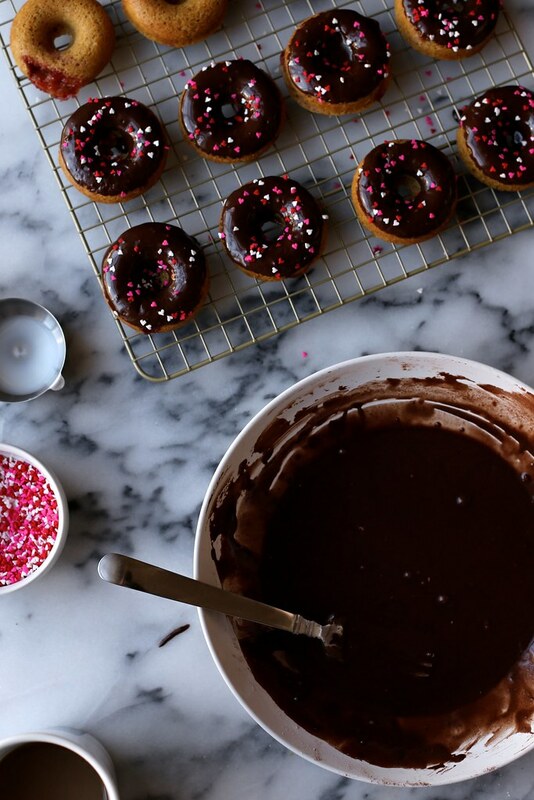 A donut is not a donut without glossy chocolate glaze. Chocolate powdered sugar, a good pinch of salt, and enough milk to create a thick but pourable glaze. Tender little donut bites! Perfect for sharing and extra lovely with Lavazzo Coffee. Add the wet ingredients all at once to the dry ingredients. Stir together until no flour bits remain and all of the ingredients are well combined. 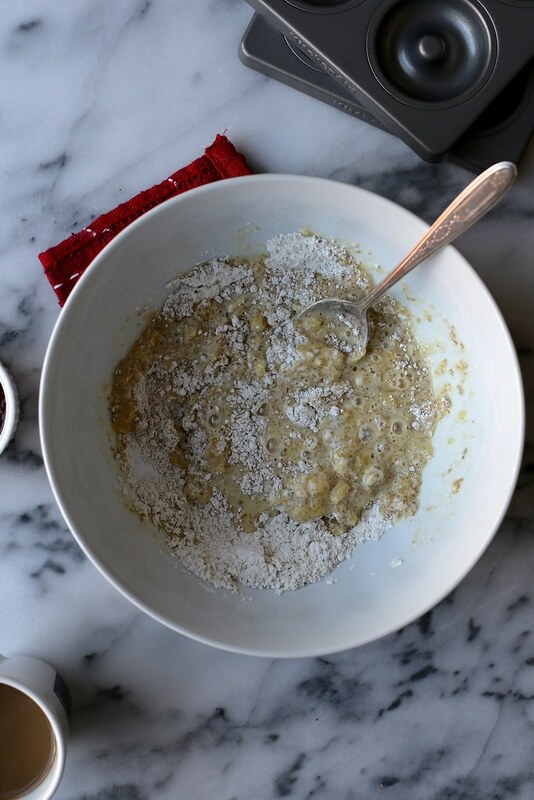 Try not to overmix the batter. That might create rubbery doughnuts. 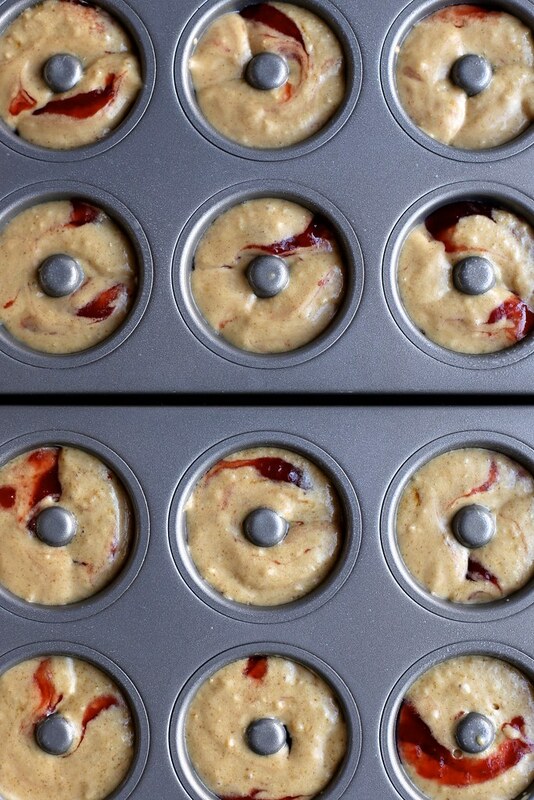 Add the jam and swirl into the batter leaving big streaks of jam. 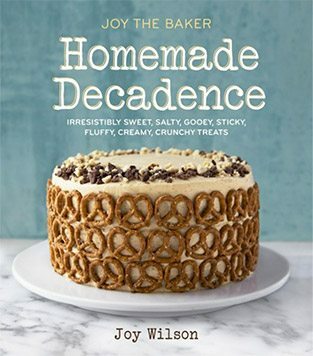 To make the glaze, in a medium bowl whisk together powdered sugar, cocoa powder, and salt. I didn’t sift my powdered sugar. I was able to whisk the lumps out. 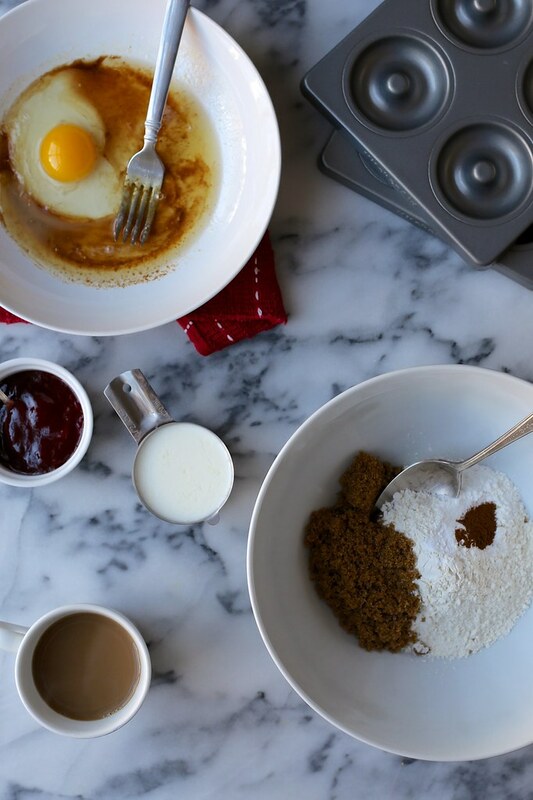 If you have stubborn powdered sugar, sifting before is best. Add 2 tablespoons of milk and vanilla extract. Whisk to combine. Add more milk as necessary to create a thick but still just pourable glaze. 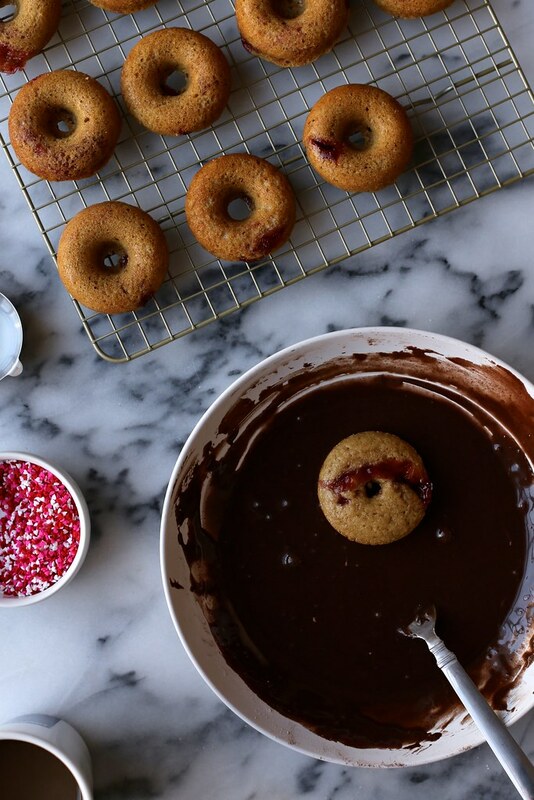 Once the doughnuts are completely cool, dip top-side-down into the chocolate glaze. Return to the wire rack and sprinkle with toppings. Allow to set for about 30 minutes before stacking or serving. Doughnuts are best within 2 days. This post is sponsored by Lavazza Coffee. All opinions are my own. I have no traditions because every year it’s different! Or wait… Is eating any sweet treat I can get my hands on a tradition? Because that’s mine. For all the holidays. My favorite valentines day tradition is getting a small note from my now husband. I say yes to all of this…the donuts, the coffee and Harry & Sally. My favorite Valentine’s Day tradition is leaving/getting a little note from my now husband. We usually spend every other year with our kids (age 12 and 9), we plan and make a special dinner together. When is our year to celebrate alone we get a sitter and hit the town for a movie and nice dinner. My husband and I got married in the fall of 2013, so we’ve only had one Valentine’s Day as married kids, but it was definitely my favorite. We made your recipe for Ritz cracker & strawberry ice cream sandwiches dipped in chocolate in our little apartment and went to a movie. Simple, fun, and loving ???? My mom has made it a point to make every Valentine’s Day special. Every year she takes me to lunch, buys me something special (preferably in pink or red), and goes out of her way to find the prettiest Valentine card. My grandmother used to do the same for her and we have been keeping it a generational tradition for years. One year, mom even surprised me at college and took my roommate and I out to a Valentine’s Day dinner! This year we are miles apart and I’ll be celebrating with my husband, but my mom is still my Valentine Pen Pal! I snuggle with my cats and leave the clumps of fur that get stuck to my clothes so that wherever I go, they’re always with me.